Partly Printed Document Signed, “Alphonse Capone,” one page, 8 by 3 inches, November 18, 1926. Also signed by his mother Theresa Capone and his wife Mae Capone, and endorsed on the verso, “Alphonse Capone,” as well as by Theresa and Mae Capone. A loan from the Lawndale National Bank, “Due on the 18th day of May A.D. 1927 with interest at the rate of seven per cent per annum, being for an installment of interest on our principal note No. 1 for the sum of $500.00.” With a “paid” bank stamp in the lower right corner of note. From 1925 to 1930 Al Capone was busy syndicating and expanding Chicago’s vice industry. He controlled speakeasies, bookie joints, gambling houses, brothels, horse and race tracks, nightclubs, distilleries, and breweries, making an estimated $100 million a year. However, “two kinds of turmoil that continued throughout 1925 were so severe that they drastically reduced the outfit’s profits. The lesser damage came from legal and citizen action . The more serious damage throughout 1925 came from gang warfare all over town. Nobody tended to business; they spent the year shooting each other . Disintegration fed disintegration until they were all at each other’s throats ” [Robert J. Schoenberg, Mr. Capone]. Then in 1926, he was arrested for murdering three people, but Capone was brilliant at avoiding prosecution, always finding an alibi to protect himself. One of the few times he was put in jail was on July 28, 1926; it was only for one night and he was released for lack of evidence. It is possible that at the time the present loan was taken out, Al Capone was short of funds. Although his estimated income was staggering, “expenses ate up a lot of the gross. By 1929, Capone would claim to be paying $30,000,000 a year just in political and police protection. No one knew, probably including Capone, exactly how much he raked off as his share. the government could persuasively detail $218,057.04 for 1927, and that could scarcely have accounted for a tenth of reality. He needed every penny to support two outrageously expensive habits, gambling and generosity” [Schoenberg]. Al Capone’s relationship with his mother Teresina (Theresa) and his wife Mae was a close one (even though he also had mistresses). They all lived at 7244 Prairie Avenue. “Theresa, the honored dowager of the clan, lived on the top floor of the house. On the first floor, in a suite of rooms at the back, lived Al, his wife, Mae, and their boy, Sonny . Other brothers came and went, using rooms in the house as they needed . In sum, it was a crowded, noisy, lively household . The unpretentious house would serve as Al Capone’s residence of record for as long as he lived in Chicago. Although Capone was often absent for long periods of time he always returned here, to breathe the unpolluted air, to feel normal again, a man with a wife and a child . ” [Laurence Bergreen, Capone]. 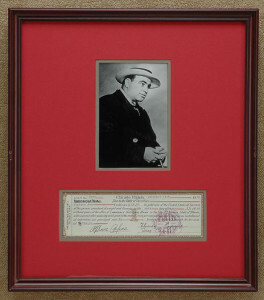 Matted in red and gray, with a waist-length portrait photograph of Al Capone holding a cigar. Framed in a mahogany wood frame, framed dimensions are 14 1/2 inches wide by 16 1/2 inches high.